Nine playful, casually interlocking stories, set in a familiar yet surreal contemporary world. A collection is, by my lights, a chance to build a universe, an overarching ecosystem. But it’s common enough to encounter a hodgepodge instead, where flashes of brilliance are undercut by clunkers. 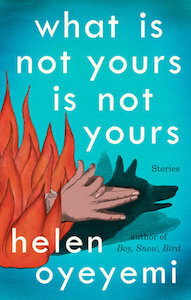 While What Is Not Yours Is Not Yours is linked loosely by keys (and also by character — a figure in the wings of one story might take center stage in another, a structure that recalls Yoko Ogawa’s devastating 'Revenge'), the collection is even more urgently ­united by the author’s playful, inventive sensibility. Oyeyemi has created a universe that dazzles and wounds. The book contains the same sly humor, gorgeous writing and magical characters as her previous efforts. It is, in a word, flawless. [H]er broken little stories come so devastatingly alive, even while remaining so achingly incomplete. Life offers no resolution, and keys and locks spend most of their time not finding each other. Dreams never come true. But as 'if a book is locked…' suggests, there’s probably a good reason for that, don’t you think? What did you think of What Is Not Yours Is Not Yours?